Grade A office space with air conditioning throughout and excellent car parking. Situated within a business park environment on the A34 dual carriageway with direct links to A500 and M6 Motorway. 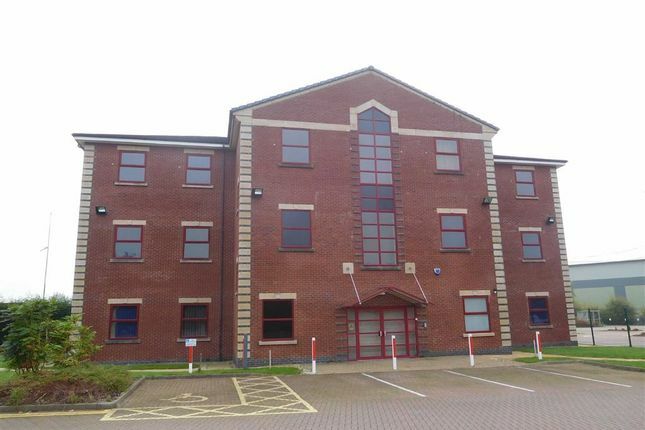 The property comprises a self contained office building of modern specification over three storeys. The building is steel framed with brick elevations under a pitched tiled roof and has double glazed aluminium windows. A central core accesses each floor and there are male, female and mobility impaired toilets to each floor. Each floor has suspended ceiling with acoustic tiles and Category 2 lighting. There are also suspended raised floors and a 13 person 1,000kg passenger lift. The site has 191 car parking spaces which are shared with the adjoining office suite. The property is situated on the successful Lymedale Business Park on the A34 dual carriageway providing a direct link to the A500 dual carriageway and the M6 Motorway at junctions 15 and 16. Newcastle-under-Lyme has a population of some 75,125 people and the Town Centre is approximately one and a half miles from the property which is the administrative centre and main retail and leisure area for the Borough of Newcastle-under-Lyme. The property is available by way of a new lease on terms to be agreed. Bjb recommend that potential occupiers make their own enquiries to the local authority in order to satisfy themselves that their proposed use is authorised in planning terms. On agreed terms the ingoing tenant will be required to pay a fee of £85 to buttersjohnbee for the application and collation of references and credit data from a third party. The application process will, under normal circumstances take between two and five working days. The applicant will be required to complete a simple online form for submission to our credit reference agency. Application fee will be payable in advance and will not be refundable. The Rateable Value is to be confirmed. The standard non-domestic rating multiplier is 49.7 Pence in the pound. The small business non-domestic rating multiplier is 48.4 Pence in the pound, for properties with a rateable value up to £18,000. Bjb recommend parties make their own enquiries into any further business rate relief which may be available. Strictly by appointment via bjb commercial, Head Office, Lake View, Festival Way, Stoke-on-Trent ST1 5BJ. Telephone . Opening hours are 9.00-5.30pm, Monday to Friday.